Not last week but the week before, Grandma signed Rachel up for sewing lessons from a young woman in our ward. She had four one-hour lessons, finishing up with her project (a skirt) on her birthday! 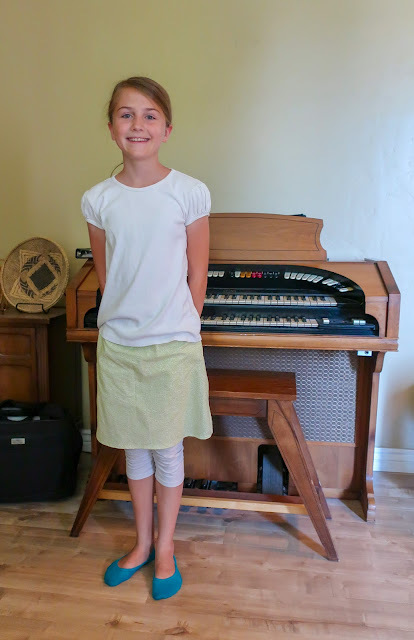 She wore her skirt to church today and looked lovely doing so. Grandma took the big girls out to the fabric store so that Rachel could pick out this material for her skirt and to help pick out quilting fabric for Arwyn and Alexander's baby quilts. She said they were in fabric heaven, which I totally believe. They were in awe of how many beautiful (and how many nerdy (Doctor Who, Harry Potter, etc)) fabrics there were. Hopefully there will be more sewing in this house in the future!